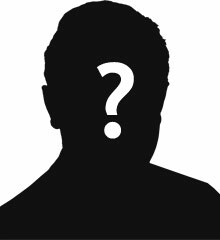 David Glass was the son of Lizzie Glass. He was born in Dungannon about 1899. The 1901 census records Lizzie as having 2 families. It seems she remarried sometime between 1889 and 1995. David Glass is 2 years old and living with the family at Brooke Street, Dungannon. By 1911, the family was still living in Brooke Street. David was 12 years old. His mother Lizzie was now a widow. 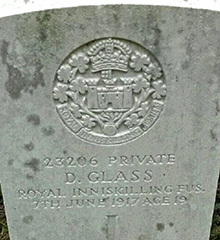 Private David Glass was serving with the 9th Battalion of the Royal Inniskilling Fusiliers when he died of wounds on 7th June 1917, age 19. Cemetery: Bailleul Communal Cemetery Ext. Bailleul is a large town in France, near the Belgian border, 14.5 Kms south-west of Ieper and on the main road from St. Omer to Lille. From the Grand Place, take the Ieper road and 400 metres along this road is a sign indicating the direction of the cemetery. Turn right into a small road and follow for approximately 400 metres. The cemetery is on the right and the Communal Cemetery Extension is at the bottom end.